There are many ways to support Chadwick Arboretum & Learning Gardens and we welcome your participation at any level. For specific information about these possibilties, please email Mary Maloney at maloney.23@osu.edu or call her at 614-688-3479. 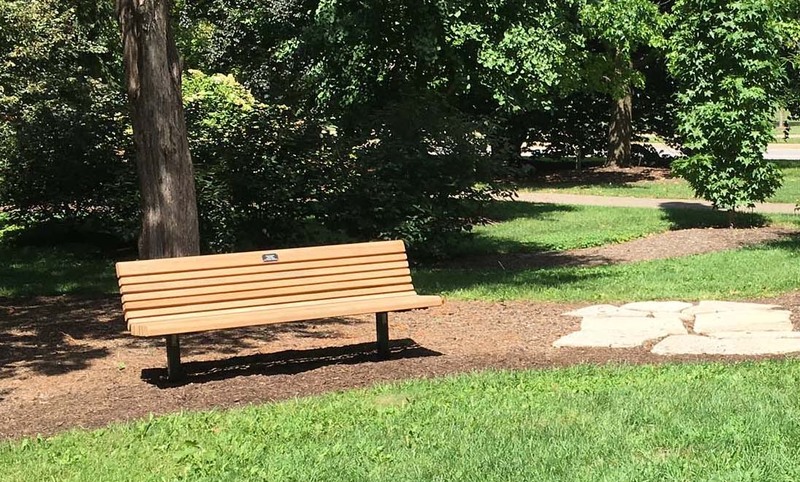 Trees and benches that honor the accomplishments or are given in memory of a loved one, colleague, or organization, can be installed within the three garden sites of the Chadwick Arboretum & Learning Gardens, and on the general Columbus campus grounds. The director of the Chadwick Arboretum consults with internal horticulture and design staff to determine the planting location and species of the trees, and the location of benches that are installed within the Chadwick Arboretum grounds. For commemorative and memorial trees and benches installed on the general Columbus campus grounds, the arboretum director consults with the University Landscape Architect on species of trees and planting location, as well as the location of benches. For more information about our Commemorative and Memorial Tree and Bench program, please contact the Chadwick Arboretum at 614-688-3479 or email to ChadwickArboretum@osu.edu. 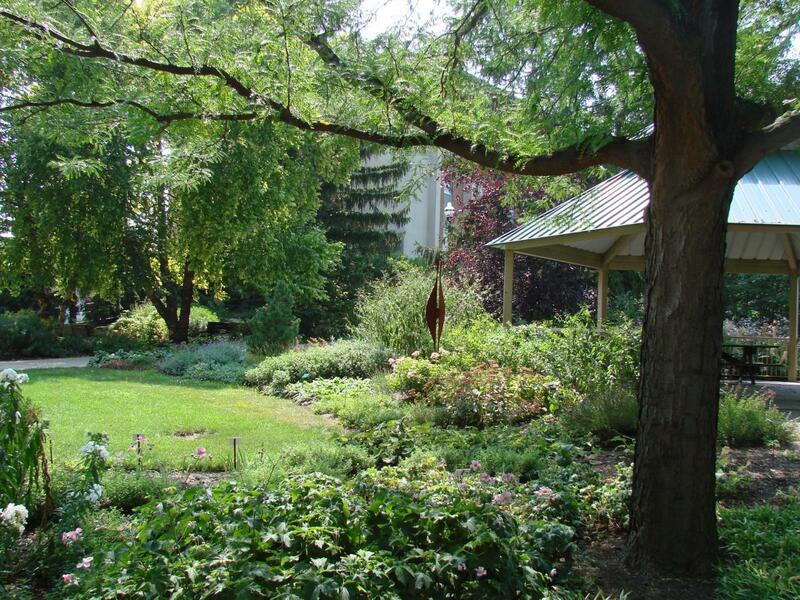 The partnership between the arboretum director and the University Landscape Architect enhances the horticultural teaching collections and ensures a diverse and beautiful landscape throughout the Arboretum and the greater Columbus campus. Commemorative and memorial trees are professionally planted and can endure for more than a lifetime, but are only replaced if damage or death occurs within the first 5 years of planting. The cost of installing, maintaining, and mapping a commemorative or memorial tree is $3,000. New trees are typically planted in fall. Additionally, there are existing trees or recently installed trees on campus that can also be designated as a memorial or commemorative tree. All commemorative and memorial trees will be recognized with a 2" x 4" metal plate mounted on a wooden post. The plate may include the donor’s name, honoree’s name, and personal sentiment as space permits. A second plaque includes the botanical and common name of the tree. Records of commemorative and memorial trees with the donor(s) name, honoree’s name, and/or sentiment, as well as the location are mapped through the OSU GIS Maps site. Trees can be searched by species, genus, common name and memorial name. Select “Zoom to” to locate the tree of choice or “Clear” to clear the entry. As you enter information into the “Search Value”, trees that match the entry will highlight on the map. Therefore, it is best to start the search from a “Zoomed Out” view. As you type in the box, suggestions of matching trees will generate in a list. Finish your entry and hit "Enter". If you select a tree from the list, you are only selecting one tree, whereas typing in “Oak” and hitting "Enter" will highlight all the oaks in the map view. Benches are 6′ long with redwood slats and black steel legs. benches may be placed throughout the garden locations of Chadwick Arboretum. Benches also include a metal plate with a 3- or 4-line sentiment. The cost to install and map a commemorative or memorial bench is $2500 for a redwood bench. Benches are installed when weather permits. 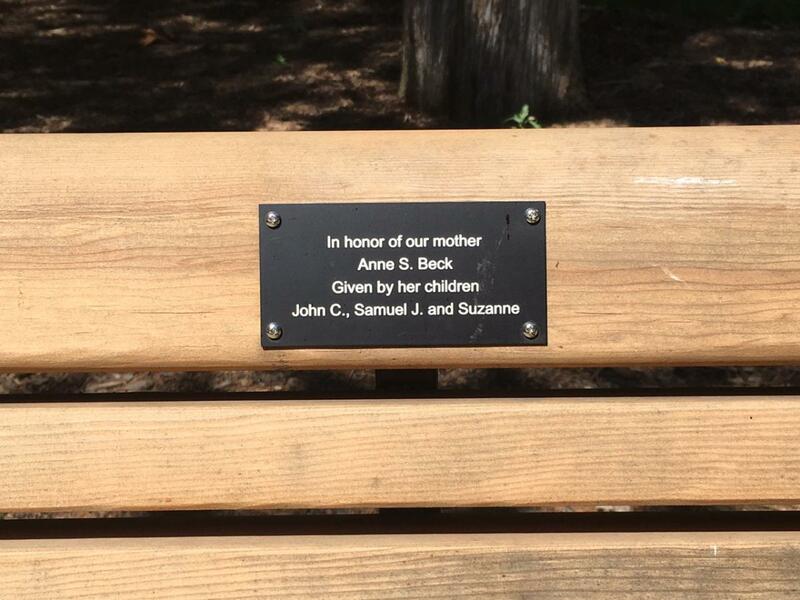 This is an example of a redwood bench with a metal plate and a 4-line sentiment. Commemorative and memorial benches are 6′ long constructed of metal with black powder coated finish. Benches can be placed on plazas or a concrete pad within lawn spaces. Location is coordinated through the Chadwick Arboretum and approved by the University Landscape Architect. The cost of a memorial or commemorative bench is $3500 for a black metal bench. Benches are installed when weather permits. All benches will be recognized with a 1" x 3" metal plate attached to the center back of the bench. The plate can include the donor’s name, honoree’s name, and personal sentiment as space permits. Bench records, with location, donor’s name, honoree’s name, and sentiment, are maintained in the Chadwick Arboretum database. Benches are replaced only when damage beyond repair occurs within 5 years of installation. Rustic limestone benches (6′ x 1′5" x 6") can include an inscribed sentiment on the front facing edge, or they can include a 12" x 3" bronze plaque with sentiment on the front facing edge. Either is available for $5,000. Placement locations are available in the Labyrinth Garden of the Chadwick Arboretum Lane Avenue Gardens. This bench is an example of a limestone bench with a bronze plaque. The Forget-Me-Not Garden is a planting of Brunnera macrophylla ‘Jack Frost,’ which is the perennial forget-me-not flower. It blooms a dainty blanket of blue in early spring and continues to bloom sporadically throughout the growing season. The planting is located in the Lane Avenue Gardens, just west of the entrance trellis. A donation to the Chadwick Arboretum Forget-Me-Not Garden can be made to commemorate a special event like a birthday or graduation or in the memory of a friend, colleague, or family member. A letter from the arboretum is sent to the designated recipient to let them know that a donation to the Forget-Me-Not Garden has been made in their honor or in memory of their loved one. For more information about our Commemorative and Memorial Tree and Bench program or the Forget-Me-Not Garden, please contact the Chadwick Arboretum at 614-688-3479 or email us at ChadwickArboretum@osu.edu. Click ChadwickArboretumGiving to make a donation online. When providing your donation through the online option, be sure to complete the Special Instructions section to specify that the gift is in honor of someone or in memory of someone. In the Special Instructions section, please specify the name of the person for which the gift is given and the type of endowment (Endow a Tree, Endow a Chadwick Arboretum Bench, Endow a General Campus Bench, or the Forget-Me-Not Garden).